If you have been looking for info about the Long Trail, how and where to resupply, what food to take, what gear to take, etc..for a thru-hike or section hike, this site is built for you. 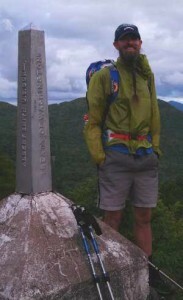 Beginning at the Northern Terminus on a windy June morning. In a nutshell, I am aiming to create a site that was more comprehensive than what I was finding online. When preparing for my hike, I found some blogs that had information on them about the particular thru-hike of that individual…those were very helpful. With this site, I am hoping to take things a step further. I was fortunate to have hiked the lower portion of the trail that coincides with the Appalachian Trail (the southern ~100 miles) just two years before my hike of the Long Trail, so I had some familiarity with that section. In addition, I hiked with a friend who had hiked the Long Trail a few years prior (Thanks Phenix!). One could argue that the information that is needed to do a thru-hike or section-hike of a long trail can be found in a guidebook for any particular trail. I guess I see books and a resource website like this as having complimentary roles. Official (or unofficial) guidebooks help and I definitely recommend getting them (click here to go to The Green Mountain Club site to purchase), but info about different styles of hiking, preparation (body, food, and otherwise), resupply/accommodation commentary and personal experiences are often beyond the scope of guidebooks. So that is my goal, to provide a different and complete resource. To a great degree, this site has a lot of personal anecdotes from my experiences on the trail, hopefully those thoughts and reflections will help you plan for your hike, give you some tools/references and prepare you to have a successful and enjoyable hike. This will be a living resource and will be updated as I learn of changes as well as when additional information is requested. Keep in mind, it is just a perspective, there are a lot of approaches to a successful hiking experience on the LT. If you have something that you’d like to see written about, please write to me from the contact page. ALSO-> Check out the site Long Distance Hiker (longdistancehiker.com), where my wife (SweetPea) and I have all of our long distance journeys chronicled, along with articles and interviews with other folks in the long distance hiking community.